Beachcombers Bazaar Henna Studio and Supply: Weddings, Henna, and More! awesome henna Jody! I love it! I hope you guys had a wonderfun time! Thanks Ena! We did have fun. The bride got wonderful color, which means her mother-in-law loves her very much! Hi, Jodi, how does one tell if there is black henna, the above picture henna looks black, and a lot of people have the henna colored black, but is it a dye or stain as opposed to what is commonly referred to as "black henna" which is not henna but rather an substitue. Henna is not black. The pictures appear black because the pictures are of the wet henna paste still on the skin. The paste is removed and leaves a stain on the skin. The stain typically starts off orange and cures in the skin over a couple of days to a brown or brownish red. 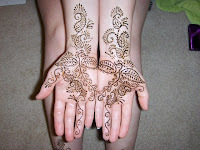 You can see explanations and pictures on my henna help site, www.ShopHenna.com. When looking at henna pictures, if the henna looks black, look closely to see if it looks like paste.